September has always been one of my favorite months. The chill of fall is in the air, the colors begin to change, and dusty sweaters emerge from the back of closets. The excitement of a new school year arrives, friendships are rekindled, and people are returning from vacations and adventures with a new perspective on the world. With all the wonderful things that September brings, there’s also difficulty that comes. Added stress, the changing of the seasons, and the low that follows vacation highs make September a challenging month for mental health. 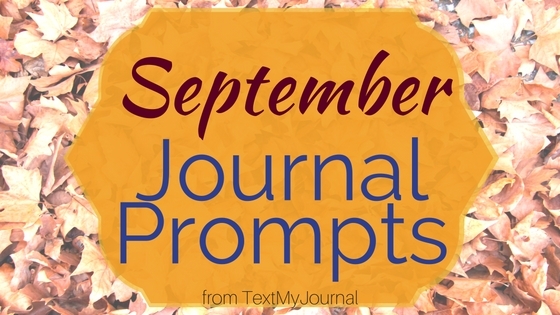 We’ve crafted our September Journal Prompts to promote improved mental health. Here’s our disclaimer: we’re not mental health professionals and you shouldn’t see these prompts as a substitute for any medical advice. Our goal is to get you thinking, get you writing, and help you find avenues maybe you hadn’t considered. We’re all in need of optimal wellness, and that includes mental health! So get writing! 1. How have you improved someone else’s life? What did you do? How did you help them? How did this help you? 2. Write one of your individual gifts or skills. How do you use this to improve the world around you? 3. What was the worst thing that happened to you today? How did it affect the rest of your day? 4. Write one specific goal to accomplish in the next week. It doesn’t have to be huge! Just one goal. 5. What is one way you can improve in the next week? 6. When do you feel at peace? 7. Look at your day from your 6 year old self. What would they wish you’d done differently? What would they be proud of? 8. Make a list of everything that is adding stress to your life. What is one thing you have control over on that list? 9. What is a habit or vice you’d like to change? Why? List 10 things you can do instead of that thing. 10. When do you feel joy? 11. Write in a stream of consciousness. Write for 10 minutes straight. If that’s too much to handle, write for 3-5 minutes straight. No filter. No censor. Just write. 12. What is one way you can improve in the next 24 hours? 13. List every tiny victory you had today. 14. Who have you helped today? Be specific – how did you help? 15. Make a list of 5 things that lift your mood. Put it somewhere you can reference often. 16. What is one habit you’re grateful for? How does that habit improve the quality of your life? 17. In what ways are you better today than you were a year ago? 18. Take a moment to sit in silence. Where is your attention drawn? 19. When do you feel helpful? 20. What is one thing you can do for yourself today? 21. Where can you go to lift your mood? 22. What person has made your life better? What specific actions did they take to help you? 23. Who is in your life that you are grateful for? What can you do for that person today? 24. Complete this sentence: Today I feel __________________. Because I feel that way, I will _________________. 25. When do you feel content? 26. When you’re in a good headspace, write yourself a pep talk. Be sure to use specific things about you – don’t just generalize. 27. Pick a word to focus on for the next 7 days. Write it somewhere you’ll see it. Make a list of ways you can add the essence of this word into your daily routine. 28. Make a list of five things you’re grateful for – one for each sense: sight, sound, smell, taste, and touch. 29. How do you deal with anger or frustration? How could you improve your reactions? 30. Write about a current challenge from the perspective of your favorite book character.